the post was about getting movesets (there is a system in place for that). If you've read the rules thoroughly and you're sure your post didn't fit any of the categories, read onward. Step 2: Locate your post, and provide a link to it. If your post was taken down, you should be able to find a notification about it in your updates area, or find it through your Ctrl + H browser history. If all else fails, describe your post thoroughly so we know which you're addressing. Step 3: Check your post using the link. It is possible your post is public, and you've simply struggled accessing it. You'll know if it's indeed hidden if it is faded white -- in that case, proceed onward. Otherwise, it is either public or pending review -- in that case, it's simply a waiting game from this point. Step 4: Leave a message here! Paste the link to your post, and give some context if you deem necessary. A staff member or other reputable user will respond with an explanation as to what happened. Please, do not respond aggressively: you aren't going to have your way screaming expletives at us. If you're nice to us, we'll be nice to you. Posts here are removed over time to prevent clutter. Hey you, did you actually read these steps before posting? In full? Ignoring things is probably what got you here in the first place! Fizz I’m confused because I never saw the original question on my questions page, so I assumed it was never posted and redid it. How come you knew about both questions existing but I couldn’t find either of them on my questions page? Does this mean that it was stuck in the spam filter and you saw both or... Can you please explain and thanks in advance! You’re right on all fronts, actually. Both posts showed up in the mod queue, so I let the most recent one through (I assume this is what people prefer). You can’t see posts you submit if they’re still pending review, which is probably a fault of the software. In the end though, the post will be approved and you’ll see it on your questions page, or it’ll be removed and show up in your updates list. Rest assured, we see everything that does get submitted. I think the Taco person closed a bunch of long-unanswered questions in the past few weeks. While I agree that some of them were dumb and probably better off closed, there are at least 10 that I think should be reopened. I don't see how anyone can argue against the claim that people like shiny hunting. There are multiple Internet communities dedicated to it. The answer to this question might help shiny hunters who have no access to real Japanese Pokemon. If finding the answer would take too much work for what it's worth, why did it get 4 up-votes? And why did I do the work to find it? Please re-open this so I can really answer the question. There is a Bulbapedia admin who is asking the same question. For those of you who don't know Tiddlywinks, he/she/it is the one who undoes other peoples' edits for being too trivial. Again, people like shiny hunting. If there's a question that might make chaining easier, why would people not want to know the answer? If glitch research is trivial, why does Bulbapedia have 164 pages in its glitches category? I haven't played a MD game, so I can't say for sure that this question is useful. Did whoever closed it play a MD game? If no, how can he/she/it be sure that the question is not useful? The answer to this question can give me rare berries. This can answer other questions, such as "I just found a level 6 Magikarp. Should I train it to level 13 or try to catch a level 13 Magikarp?" If people can find encounter chances for tall grass, why can't they do the same for fishing? Knowing more about rematching regular trainers will make farming EVs and money easier. If this is trivial, why did it get 7 up-votes? Yeah I think you're right, a lot of those aren't bad questions per se, just difficult to answer. I think while not rule breaking, if some questions are borderline unanswerable then I don't necessarily see a reason for it to be up there, but also theres no reason for it to not be there since it's possible that someone does eventually find a way to answer it or if information is found via datamining or new methods. It comes down again to the new guidelines we work on, and whether or not incredibly trivial and unhelpful questions have a place here, something we're unsure about. It basically comes down to opinion, which isn't incredibly helpful I know. I won't reopen much because I want to hear some opinions from others before we go around overturning other auth's decisions. Many of these have been open for a long period of time, which goes someway to explain why they'd eventually be closed, but again it is possible that they'll eventually be answered. Oh and in the future, if the question has an actual reason to it, say so. For example, with you wanting to get rare berries from the palpark catching show question, you should have mentioned that it has an actual purpose in the first place. I agree with what PX said. Especially his last paragraph. When you say "please don't question my curiosity," it makes your questions seem a lot more trivial, as it makes it seem like your reason(s) for wanting to know the answer are either stupid or nothing more than "just because". If you legitimately think that a question that seems trivial has good application, give a good reason as to why you're asking it. I'd also like to point out that, if you do have the answer to a question closed due to how trivial it is, just comment on it saying that you don't think it's too trivial to deserve to be closed and you have the answer. I don’t think “just because” is necessarily a bad reason. Sometimes things are interesting without having much use, especially the more technical things. I think I’ve said this before but I don’t think it’s a problem to have unanswered questions here. 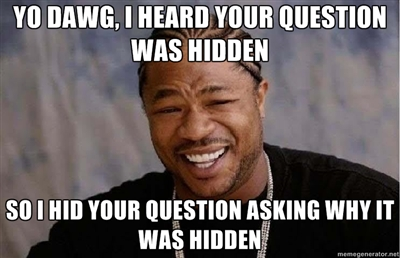 Look at any Q&A site, they have hundreds or thousands of unanswered questions. We do very well comparatively. I’ll take a closer look at the questions listed above and reopen any I think are worth keeping. I can start explaining myself better, but what about all those other "trivial" or "low quality" closed questions? Why do editors get to close them just because the askers haven't read this comment chain (which will likely be hidden in a few days) and the editor can't imagine how the question is "useful"? @Pokemaster Now that you're here, can you look at this? https://pokemondb.net/pokebase/meta/68732/ I personally think it's more important than closed questions. Upvotes don't justify the relevance or trivial nature of the question. Anyone can upvote. I'm going to second the "Don't question my curiosity" assessment however, even though Pokemaster gave his own opinion. It tends to connotate a lack of purpose of use and the doesn't affect the question in any positive way. "The people who up-voted this question want to know the answer." doesn't count as a purpose? Suggestion: Make a Why was your post hidden message. Why did my post get hidden by itself? If an answer got hidden, would the comments for that answer go on another answer/the question or just disappear? Why is my grav not appearing on any of the questions/answers I post? I just hid my post and when I tried to show it again it didn't come back,why? If while I'm answering/commenting the question gets hidden, does my input get added?? The best suggestion about downvotes ever.